Born in Fontanelle di Roccabianca (Parma) on 1st May 1908. He began his career as a journalist in 1928, as a proof-reader for the magazine Corriere Emiliano, later becoming its editor. In 1936 he joined Rizzoli as editor-in-chief of the satirical weekly Bertoldo. Along with Giovanni Mosca, in 1945, he founded the weekly Candido, which they ran together for five years. From 1950 to 1957, Guareschi was its sole director and he continued to work there until 1961, when the weekly ceased publication. He later collaborated with Bourgeois and Alla Notte and, until 1968, wrote a column for Oggi. 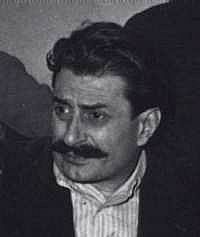 A cartoonist, journalist, humorist and writer, famous as the author of comic novels and short stories, the creator of Don Camillo and Peppone; his works have been translated into almost all the languages of the world: from the best known to Icelandic, Maharashtri, Vietnamese, Arabic, and Lithuanian. He came to live in Roncole Verdi di Busseto in 1952. He died in Cervia (Ravenna) on 22nd July 1968.